The Benchmarking Project: Which continues the work of the Alliance for Biking and Walking with a 6th edition of the biennial Benchmarking Report on Bicycling and Walking in the United States. The Bike League Hub, a membership-only forum for members of the Active Transportation Leadership Institute. Providing online webinars and in-person gatherings, like the bi-annual Active Transportation Leadership Retreat, to share best practices and increase capacity to improve local and state bicycling and walking advocacy. Learn more about the purpose behind the Active Transportation Leadership Institute. Learn about the logisitics and tools that advocates use when working for better walking and biking. 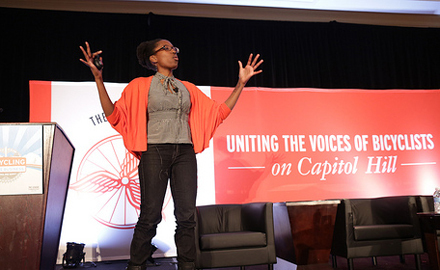 Webinars are open to the public and targeted toward people looking to become more involved in bicycling and walking advocacy. The Hub is currently offline while we make upgrades to improve your user experience. We'll be adding additional features such as a resource library, easier navigation and search tools, and more robust ways to post and catalog messages. We are very excited to be updgrading this system for you. Stay tuned for more announcements about the new Hub! Thank you for your patience and understanding.